If you didn't already know, Gtkdialog is alive! Thunor has been making some fantastic improvements and set up a new site http://code.google.com/p/gtkdialog/, so check it out. 1. the code isn't lost forever (like the goblinx gtkdialog tutorials, and probably a lot of code from distros that no longer use gtkdialog). 2. the use of gtkdialog is promoted, by showing what it has been used for. 3. all the different code can be found from one place (e.g. the list of Applications on the new gtkdialog home page). This will promote sharing/reuse of code by people using different distros, which should lead to more collaboration and improvement to the code. 4. some old code might be adopted by new developers. - vovchik's gtkdialog markup editor. - I'm guessing all the code that Barry maintains (e.g. Petget or whatever it is called now, the woof builder gui and Pmount) are all part of woof now. Is that right? - Puppy's version of the trash Roxapp uses gtkdialog for the summary feature (not actively developed, although I should really fix it to need only gtkdialog). - pgtkmenu - a simple program launcher that reads your .desktop files (not actively developed I don't think). - http://www.murga-linux.com/puppy/viewtopic.php?t=57805 and http://www.murga-linux.com/puppy/viewtopic.php?t=40277 Pmenu: menu editor (and .desktop file editor). - menumaker - make .desktop files - EDIT there is a new thread for the updated version. It is designed to create menu entries to to open apps, files, directories or urls. - Pcrypt gui for bcrypt and ccrypt. I always kinda thought that gtkdialog comes as part of gtk package? I would never thought it's a standalone project. Cool to know that it's maintained. I had been consolidating a lot of puppy code into bashbox including many gtkdialog based programs that use a lot of the same little code snippets ... refactoring, reducing and cleaning code as I go ... all the puppy programs in a single text file. This will be a great resource to keep me from missing some gems, thanks. Even though it does not contain the gtkdialog line, I added it on my application of Floppy_Formatter-1.7 and it still works great. So now I am wondering if a program that is written in gtkdialog3 script needs the gtkdialog3 -p [name of main dialog]. Cool, Multipup is gui for putting more than one Puppy on the same CD/DVD. 8-bit - I don't quite understand what you are saying. Are you sure you didn't mean to post in the gtkdialog tips thread or development thread or something? I was saying that my application was written using a gtkdialog template as a base so technically, it is a gtkdialog application. 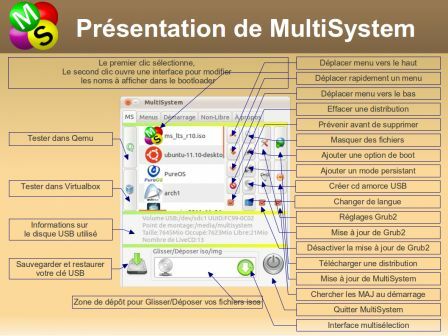 MultiSystem est un logiciel libre et gratuit développé sous licence GPL-V3 et écrit en bash/gtkdialog qui permet de créer des clés USB MultiBoot. MultiSystem is free software developed under the GPL V3 and written in bash/gtkdialog for creating MultiBoot USB memory sticks. Maybe I am dense, but I checked the link for MultiSystem and could not find any download link for the free program.